To go with my Coconut and Kaffir Lime Thai Stew, I whipped up a batch of Satay Beef complete with a peanut dipping sauce. 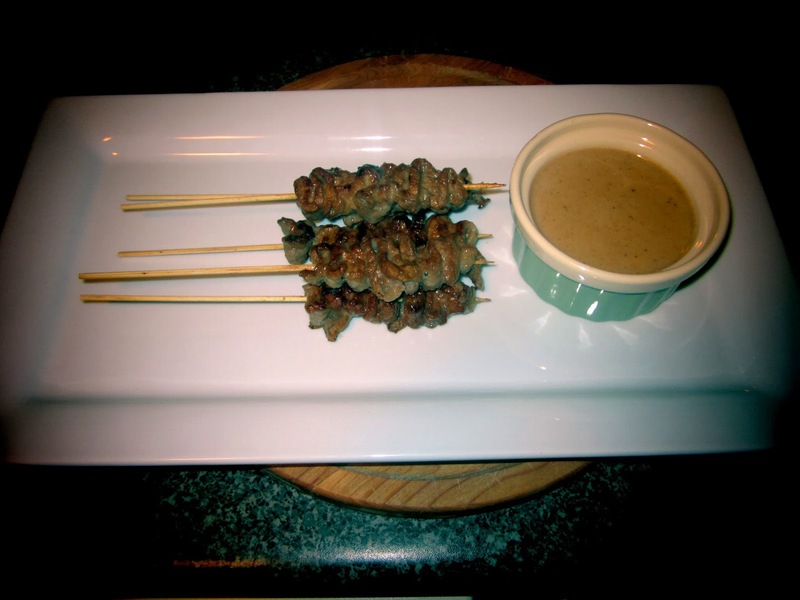 The secret to a tasty Satay is the marinade - the longer the beef marinates, the better it will taste. The best part of this dish is definitely how easy it is to make and the perfectly balanced flavours you get in every bite, of course. Soak the wooden skewers in water until you're ready to thread the beef. Mix the soy sauce, lime juice, water, brown sugar and ginger in a deep bowl. Add the beef, cover and refrigerate for 2 to 3 hours. Towel off skewers. Thread the beef on the skewers in a zigzag pattern, moving from one end of the beef strip to the other. Grill the beef for 5 to 7 minutes on each side, cooking to medium rare. Bring the coconut milk, peanut butter and lime juice up to a boil in a sauce pan, whisking until everything is combined. Reduce to a simmer and cook for 5 more minutes. Allow the sauce to cool before serving. Note: This sauce is a little on the sweet side. If you'd prefer a spicy sauce add a touch of your favourite hot sauce.